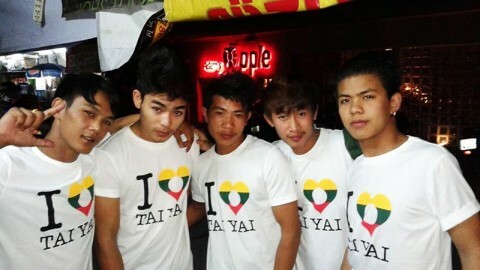 For many gay foreigners, one of Chiang Mai’s biggest attractions are the go-go bars and their boys from Burma’s Shan State. Unlike Bangkok or Pattaya, the gay host bars of Chiang Mai are staffed almost exclusively by ethnic Tai Yai (SHan) guys which have offer that special Shan magic not found elsewhere. In the latest issue (Issue 80) of Thai Puan, Thailand’s gay community magazine David Edwards provides a fascinating insight into the Shan and some background to Chiang Mai’s go-go boys. You can read Thai Puan Issue 80 online. Print copies of Thai Puan, which incorporates Bangkok Desire, can be picked up for free in most of Chiang Mai’s gay venues. One of the best places to meet Shan Guys is now Free Guy Club, a former Go-go bar which has changed its emphasis to a gay Karaoke and host bar with many gourgeous Shan guys waiting to sit and drink with you. 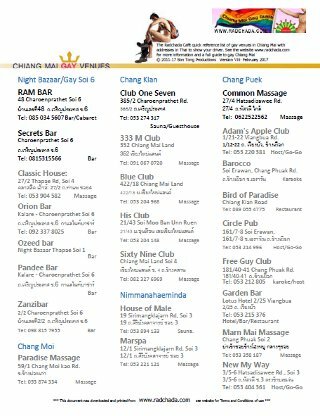 Chiang Mai has three gay go-go bars, Circle Pub and New My Way are perhaps more orientated towards Thai customers. Though if you want to find more masculine , muscular Shan guys Circle Pub is still the place to go. Whereas the Farang owned and managed Adam’s Apple Club is more frequented by foreign visitors.